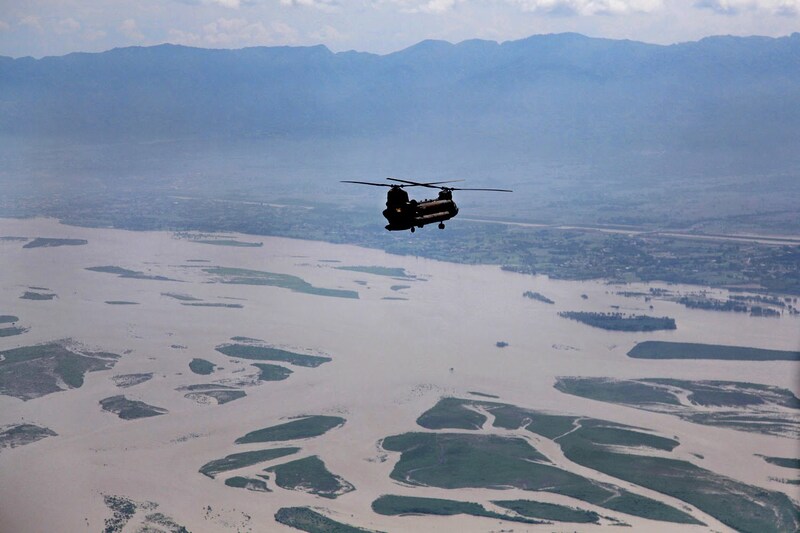 “Far reaching, devastating, … biggest challenge is scale of disaster” is how U.S. Army Brig. Gen. Michael Nagata, deputy commander, Office of the Defense Representative, Pakistan described the flooding in Pakistan during this mornings Roundatable! I was privileged to speak with him and hear how the US is again helping out during a disaster. Since the initial flooding two weeks ago US Army aircraft (2 UH-60 Blackhawks and 4 CH-47 Chinooks) from units in Afghanistan have responded with life saving efforts in the Swat Valley of Pakistan! More than 3,000 lives saved through their efforts, 500,000+ rations delivered and 160 metric tons of relief supplies provided with “a steady stream” of Air Force of C-17s and C-130s as well! With about 100 Army aircrew and support personnel preparing to transfer aid responsibility to the 15th Marine Expeditionary Unit (MEU) from the USS Peleliu and their CH-53, Sea Stallion helicopters this is truly a multi service operation. The US portion is but a small piece of the Pakistan efforts but we have committe d $40 Million to aid with a fluctuating number of personnel on the ground of approximately 350 personnel (250 were already in place before the flood) Airlift and at sea forces provide additional manpower that is not "in country". 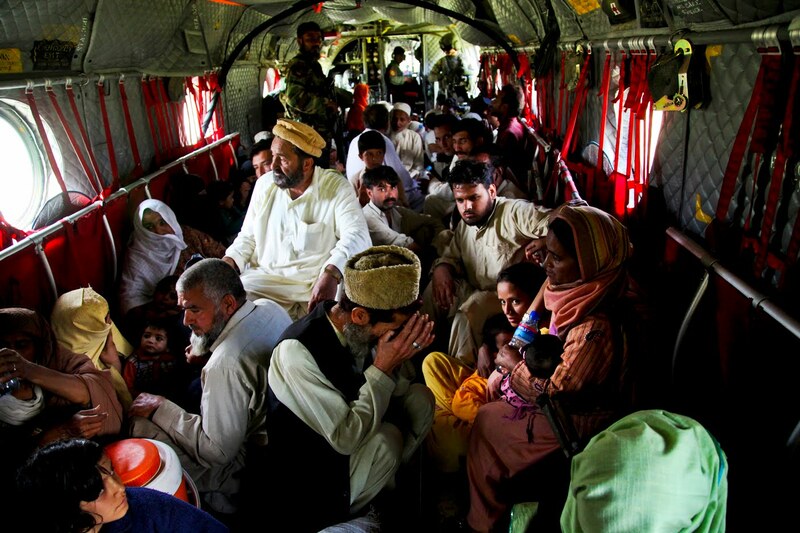 But more important is the appreciation of the Pakistan people involved in this disaster! Take a look at the faces of survivors in Army photographs while being transported on aircraft or unloading supplies and you see smiles, concern for their future but above all they seem grateful! In fact General Nagata described their response as “impressed, grateful, enthusiastic” about the aid from the US and Pakistan military personnel working in close cooperation and at the request of the Pakistan government. The Swat Valley is the scene of terrible fighting between the Taliban and Pakistani forces and this flood has just made the average family’s lives just more difficult! The general said that the US humanitarian efforts have not been impeded by any action of the Taliban due to the presence of Pakistan forces. He outlined the US efforts as requested by the Pakistan government and purely humanitarian despite concerns in the Pakistan press about US Marines arriving in country. No incidents have occurred at this point between US forces and Taliban in the area. He highlighted the “extraordinary” level of “cooperation, friendship and partnership with the Pakistani forces and citizens! As a post note he did mention that the Afghan Air Force has also provided helicopter support in a different region to alleviate the suffering of the people. Multi-national, multi-US services and Non Governmental Organizations saving lives! If you would like to listen or read a transcript of this very interesting Roundtable please go to DoDLive. To see additional pictures of our service personnel providing relief please go to DoD’s Website! To see more information on MilitaryAvenue please go to our Reading Room for up to date articles! For articles on other humanitarian responses please go to MilitaryAvenue/Disaster Response.